If you have invested in hearing aid technology, you have taken the first step on the way to healthy and enjoyable listening. Although this investment is a crucial step, the rehabilitative process will take some time to become fully effective. In addition to the initial role of an audiologist to get you started, some training in hearing strategies can lead to full rehabilitation. You might wonder what auditory rehab would entail. The following are some of the aspects of hearing rehabilitation that you can expect from this kind of program. Once hearing technology is in place, it is necessary to develop targeted enhancement of auditory functions. You probably began the process with hearing tests. These tests are necessary to understand the particular weaknesses in your hearing profile. Tests analyze the frequency ranges from low to high that are the most difficult to hear. They may also involve speech testing to see if particular types of sound, consonants, and phonemes are the most challenging. Although these tests for the baseline of your auditory rehab, they can change with the introduction of assistive technology. Once you have hearing aids in use, you may discover new weaknesses in your hearing that need to be considered for future management. These assessments consider your newfound range of hearing with the aids in place and develop a new baseline for future hearing. Hearing aids are not all the same, and many require some instruction for effective implementation. Inserting the aids properly and designing the right volume within in the units may require some instruction and assistance. Learning how to maintain and care for your hearing aids will make sure they are operating in the ideal way for your particular lifestyle and needs. 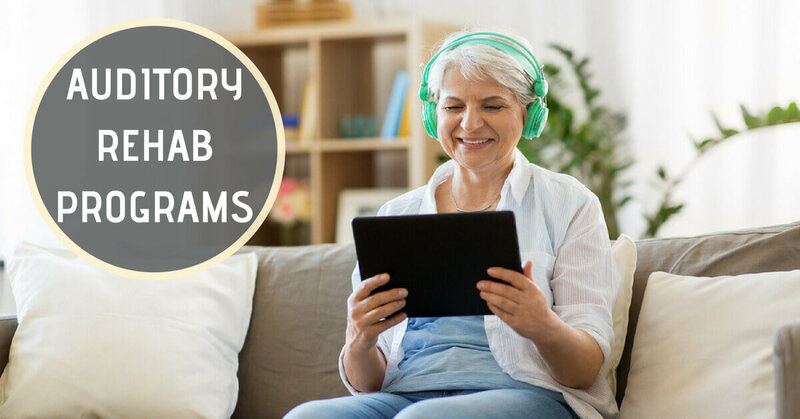 Some auditory rehab programs incorporate group exercises with others who use assistive technology to better understand how they work and to get helpful tips for their implementation. Beyond the practical instructions necessary for hearing aid use, other instructions will help you develop new habits for listening and responding to your environment, including driving and hearing in noisy places. These instructions increase the probability of ongoing use and success with your aids. Auditory rehab also includes exercises designed to become comfortable with your new hearing capability. We know that hearing is closely linked with cognition, and the ability to link sound with short- and long-term memory will require training and practice. Interactive exercises will help redevelop the link between hearing and memory for better understanding of the world around you, especially language. These exercises are specially designed to rebuild the neural pathways that may have become weakened or even damaged in the process of hearing loss. Everyday activities and communication contexts may be simulated in these exercises to prepare you for use of your newfound hearing and understanding. Your particular lifestyle, including workplace environments and leisure activities will be incorporated into your personal training curriculum to ensure that hearing is operating at its best in the regular activities of your life. When issues come up that may be challenging, it is important to have someone to talk to about these experiences. Participation in social life will be greatly enhanced by assistive technology, but the transition to easy communication may not be immediate. Newfound hearing ability can have challenges as well as benefits for your quality of life, and ongoing counseling can help you understand what to expect from future experiences. Counseling can also help you understand the residual deficits of function and activity that you may encounter even with hearing aids in place. More than all of this, it can be helpful to have someone to talk to about your experience with newfound hearing, someone familiar with the process and who can share helpful advice. The benefits of hearing aid technology are quite wide reaching, and you will be surprised at the range of activities in which you can engage. Communication is one of the greatest benefits, simply being able to hear and understand your loved ones, coworkers, and people you meet in everyday life. Yet this ability may not be immediate. Auditory rehab programs are quite effective at easing the transition from the many coping mechanisms you may have developed to get by with compromised hearing into a newfound life of easy and effective hearing.